You must make reservations at least 5 minutes in advance of the time at DEQ Terrace & Lounge - The Ritz-Carlton, Toronto. 12:00 p.m. - 2:00 p.m. & 3:00 p.m. - 5:00 p.m.
$15 Valet Parking available for $15 for the first 2 hours, $5 per hour thereafter. DEQ Terrace & Lounge is a favourite destination for Afternoon Tea in Toronto, located inside The Ritz-Carlton, Toronto. Afternoon Tea is served in the Lounge by reservation on Saturdays and Sundays ,with seatings of both 12:00pm & 3:00pm. Walk-ins are welcome for evening bar and restaurant service. Really enjoyed the experience, my only criticisms would be that 2 of the 4 sandwiches were fish/ seafood based and one of the guests in our group is not a fan of either (1 would be ok, but 50% is a lot) and the desserts were excellent but citrus based, a little more chocolate would have been enjoyed more. Service was excellent, teas were excellent and an overall fun and tasty experience. Dear DonnaP, Thank you for joining us for Afternoon Tea. We are happy to hear that you enjoyed the service and overall experience. We also appreciate your feedback. We will share this with our culinary team for review. We hope to welcome you back again in the near future. In April and May, we will have a "Chocolate Afternoon Tea" theme, that I think you will enjoy. Dear IsabelP, Thank you for choosing to have Afternoon Tea at DEQ Lounge. We are happy to hear that you enjoyed the ambiance and the sandwiches. We also appreciate your feedback regarding the sweets and will share this with our team. We hope to welcome you back again in the near future. Had an amazing time at High Tea. Service was outstanding!! Thank you for choosing to join us for Afternoon Tea. We are delighted to hear that you enjoyed your experience with us. We hope to welcome you back again in the near future. be Carnival (i.e. New Orleans/Mardi Gras) themed. There were some very interesting flavours, unique sandwiches in particular. The desserts (not all were the same listed on the menu) were all citrus flavoured, and unfortunately for me that's my least favourite kind of dessert flavour, so that was a little disappointing. The presentation was lovely though. I'd recommend to a friend who is looking for a unique afternoon tea experience in Toronto, but not someone look for something very traditional. Amazing experience as usual. Thank you to the who team at Deq. Thank you for choosing to join us at DEQ. We are delighted to hear that you continue to enjoy the experience and service provided. We look forward to welcoming you back again in the near future. My mother and I had a beautiful afternoon tea here during her recent visit. The service was beyond impeccable, and I loved the tea that was served so much I decided to buy it (Sloane tea- Heavenly Cream) and bring some home. Per usual, the amazing staff at the Ritz made the experience AMAZING and simply packed it up, added it to my bill, and brought it to the table- so I didn't have to make an extra stop at the lobby. Not to mention, it was a snowstorm outside, and the staff also kindly gave directions to get to our next destination within the PATH so we didn't have to go outside. The tea service is quite reasonably priced when you consider how much work and effort (and highest quality ingredients) go into the treats for High Tea. We loved every aspect of our meal, and took some deserts and scones back with us as well- it's more filling than you might think. While every aspect of our experience was fantastic, the standout to me was the service. We loved our servers and the staff in the lobby were amazing too. As always, a truly impeccable customer experience. 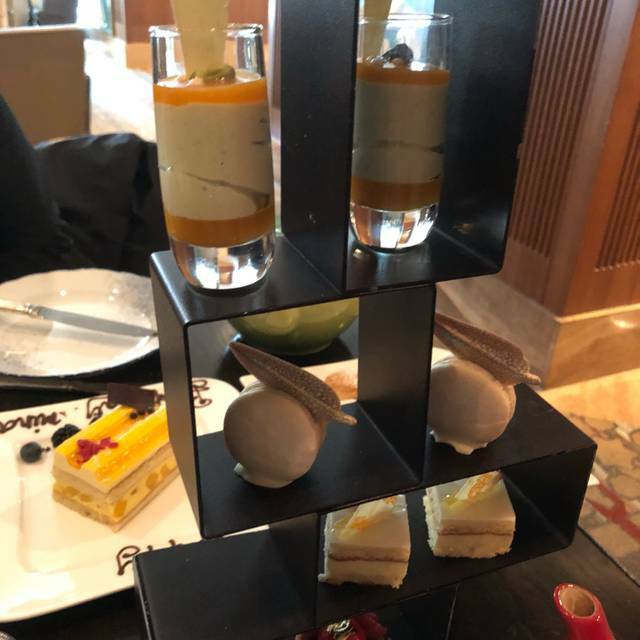 After waiting for a long time to try the afternoon tea at the famous Ritz Carlton, I was unfortunately disappointed. When you think of the name Ritz Carlton, you cannot help but expect result. As a well respected brand in the hospitality industry, the expectation of quality should be nothing short of amazing. The savoury beginning was mediocre, nothing memorable. It tastes like sandwiches you can get from most cafes downtown. As for the sweet pastries, they were barely edible. 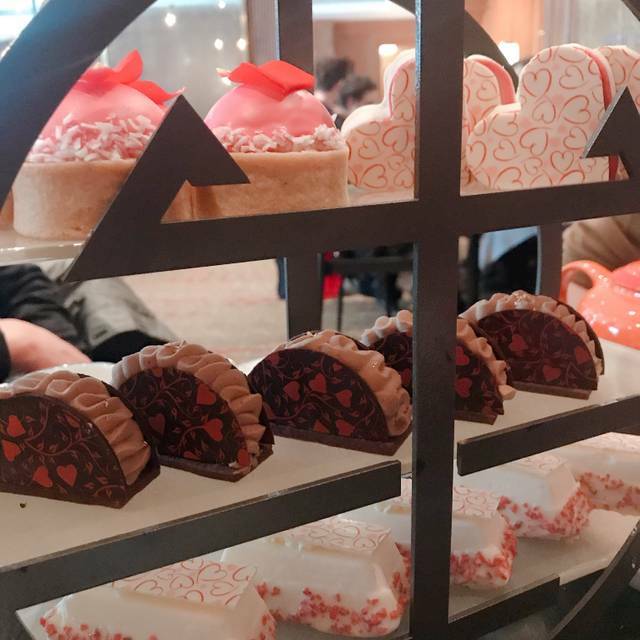 We went on Feb 24 and they were still serving Valentine’s day (rather tacky) pastries. A small detail on serving overdue, past celebratory themed date, especially for a lounge of this caliber, was almost embarrassing. The taste was truly something comparable to the plastic tray cupcakes I can pick up at the Walmart superstore. The ambiance and service experience of a restaurant sometimes make up for the poor tasting food, but even the setting and the service was 2.5 stars at best. Overall a disappointment. 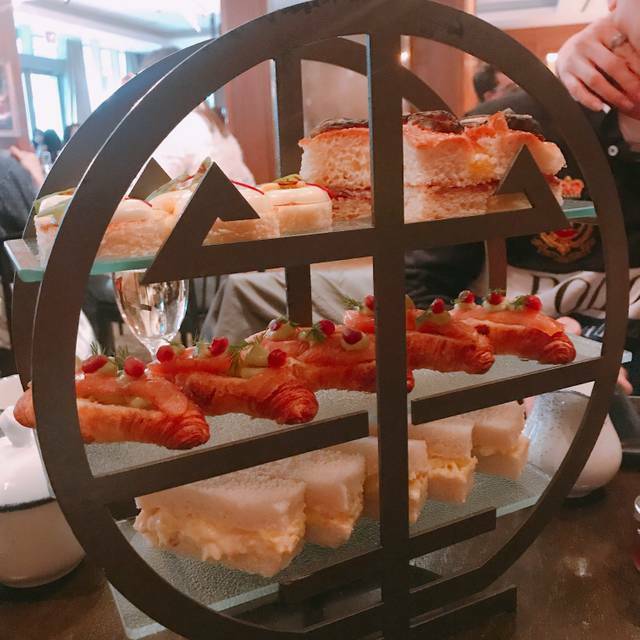 If you are looking for high tea in Toronto, I do not recommend this. It’s not even worthy to experience even once. Thank you for choosing DEQ Lounge for Afternoon Tea. We do appreciate your feedback and I will take this back to our culinary team. I am sorry to hear that you did not feel that the service or Afternoon Tea offerings. Could you please provide me with your preferred method of contact and I will have our Restaurant Manager contact you regarding your experience. The tea at the Ritz was exquisite. They were able to accommodate my vegetarian needs with advanced notice and the selections were delicious! The presentation was interesting. As a first-timer to the experience, everything was well explained. The cost reflects the venue, so it was expected. I'd do it again in a heartbeat. Dear JCB14, Thank you for choosing to join us for Afternoon Tea at DEQ Lounge. We are always happy to accomodate dietary needs when we can. We are thrilled to know that you enjoyed your experience with us and we look forwar to welcoming you back again in the near future. Wonderful spot for afternoon tea and conversation! Dear KTeats, Thank you for choosing to join us for Afternoon Tea at DEQ Lounge. We are delighted to hear that you enjoyed your experience with us and we hope to welcome you back again in the near future. Not very impressed for an event held at the Ritz. Have been stayed at the Ritz, enjoyed the club floor, spa and bar. I found the event very unsatisfactory. Simple things like pouring tea, and leaking all over the floor and in the saucer. Would not recommend. Dear RoyJ, Thank you for choosing to stay at The Ritz-Carlton, Toronto. We appreciate your feedback regarding the event that you attended. We always strive to make the best customer service and experience and I will share this valuable feedback with our team. Great selection of savoury and sweet! Would definitely recommend for anybody who enjoys high tea. Dear Micfoodie, Thank you for joining us for Afternoon Tea. We are delighted to hear that you enjoyed your experience and we hope to welcome you back again in the near future. In February, we are offering Sweetheart Tea in honour of Valentine's Day. Not impressed. The nutcracker tea was nothing special at all, 1 cookie with a nutcracker on it. The atmosphere was also disappointing, you don’t feel like you’re anywhere special. I had noted in the reservation that it was for a special birthday and it was ignored. Don’t want to doubt why people can give 5 stars to this restaurant. Wondering if they are the guests in hotel so they get complementary (or discounted) serve; otherwise, I honestly suggest other restaurant’s high tea. Similar cost, much better food/service. Only two sets of foods here; three if you count biscuits; one for mini burgers/finger foods and one for desserts); unfortunately, none of them are actually tasty. Quality of Tea is ok but nothing special. 4 person without tips cost $300. I am sure you can find somewhere else much better than this. Dear JoeG, Thank you for joining us at DEQ Lounge for Afternoon Tea. I am truly sorry to hear that you did not enjoy the dining experience. Our Director of Food and Beverage, would be happy to speak with you regarding the quality of food and service. Please see the private message for contact details. Great afternoon tea service and the food was awesome. I have always had a lovely experience with Afternoon Tea at the Ritz Carlton. The food is always great in comparison to other locations for Tea in Toronto. I love the interactive tea box that allows you to smell the different teas, much more accessible that a paper listing. The service is always professional, courteous and engaging, with a great balance between attentiveness and privacy. Recently I had some confusion, thinking I had been double charged. Every representative that I spoke with was extremely polite and apologetic, and in the end it was I who was confused, and I had not in fact been overcharged. I would absolutely recommend Tea at the Ritz for a nice girls date, and the overall experience will not leave you disappointed. Went for High Tea Saturday Dec 8, 12noon seating. Room was loud and echoed. Was seated in the middle of the room on hard chairs, which is not comfortable for a the length/type of experience High Tea is meant to be. Tea selection was lovely, food looked nice but taste was AVERAGE AT BEST. The bread on the sandwiches was dry and seemed as though it had sat out in the air too long. Had much better food at high tea at the Shanghai-la. Tea pot was stained and just dropped on the table, not poured for us. After two hours server approached and ask my guest and I to leave “as they had to set the table”, I did not see them approach the many other guests who were still seated? We both had the Royal tea option, tipped well and were courteous, unfortunatly that this didn’t seem to make a difference. Disappointed overall in the experience and with all the other high tea options in the city would not visit again. Went to DEQ Terrace & Lounge for their 'Nutcraker' afternoon tea service on a Saturday afternoon. Service is always top notch at this hotel whether you are at their bar, the lounge or their restaurant. Staff are always attentive and responsive and unlike some establishments work cohesively as a team - especially as it gets busy. Afternoon tea is served in the lounge and at times hotel guests unknowingly sit down to take a call or work on their laptop. Hotel staff do promptly redirect them to the lobby or meeting room (not sure if this will distract you as a diner). Can't comment on the bubbly selection as I was driving. The signature mocktail was grapefruit-based and refreshing. Tea selection was excellent. 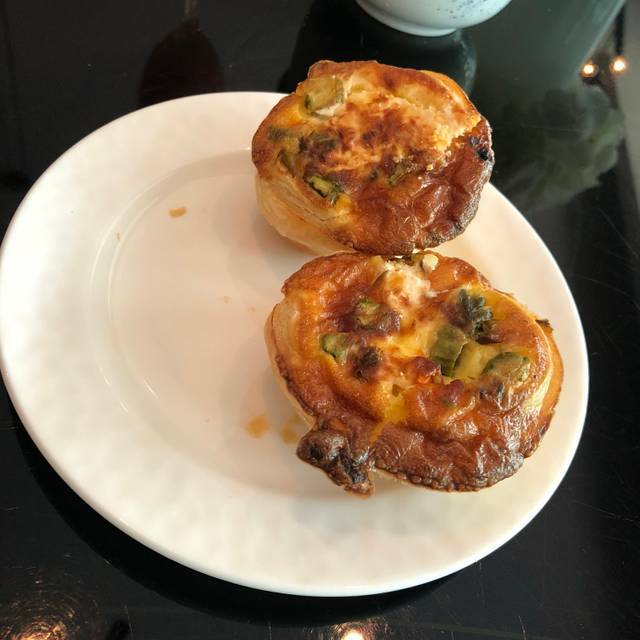 Quiche did not appear to be freshly made. Resembled more like reheated frozen pastry. The roast turkey croissant sandwich was the highlight of the experience. Scones were tiny compared to the ones they serve (or used to serve) during their Mon-Fri afternoon tea. The girlfriend was a bit disappointed with the sweets menu as three of the five items had the same look and texture. I couldn't finish the shortbread caramel cookie as it was too sweet. May go back to Windsor Arms next time for afternoon tea. My sister and I recently had high tea here and thought it was really fun. The desserts were so delicious and the presentation of it all was quite stunning. We would come here again. One of my top 3 high tea places I've been too - and I've gone to several! I attend high tea at the Ritz 2-3 times a year. They change the menu every month and the food is always lovely. Usually the service is pretty good to, this time around our party was a little disappointed in the service as it felt like they completely forgot about us several times and then at the end we were rushed out when we were still finishing our entrees because they came out so late but they had to shut down for the next tea at 4:00. The severs were a lot cooler and inattentive which I've never experienced before so maybe it was just an off day. Overall we still had a nice time. Had a really nice time at the Ritz-Carlton for afternoon tea. Our host was very lovely and polite and took good care of us. Une belle manière de célébrer un anniversaire. Serveurs et serveuses aimables et souriants. Une petite formation sur l'étiquette à table serait nécessaire. Exemple, l'ordre de préséance, en servant la femme la plus agée d'abord, jusqu'à la plus jeune, puis l'homme le plus agé vers le plus jeune. Les techniques de débarassage des assiettes et couverts devraient faire partie de cette formation! Pour la prise de commande, la personne qui invite devrait passer la commande pour ses invités. Ne pas oublier d'offrir de l'eau chaude pour les théières à nouveau. Merci de votre attention. Services are very good , we went for high tea at the afternoon and we do so asking for put candle in our cupcake the waitresses are very helpful and nice. Our friends made the wrong reservation, so we wanted to cancel through phone. The lady was EXTREMELY rude and she did not even want to help us. So we decided... we'd just show up anyways since they were going to take the $50 deposit from us. We showed up and they couldn't find our reservation... apparently it was already cancelled. They couldn't set us up a table because only one waitress working. (The waitress was polite and helpful) So we decided we should leave... they're very unorganized for an nice hotel. Our server was lovely and they were able to accommodate dietary restrictions... service was very slow though. I honestly don’t know why the rating is so high, it’s my first time here and will probably be the last time, nothing special about the food that was in both the savoury and dessert tower that was brought to our table. Personally I think for the amount, quality, and variety of food and dessert provided, it was way over priced. They had different price points based on what you want to have as a drink aside from the tea (mock tail or actual wine). My friend and I chose the Posh tea ($55 each, coz we both don’t drink), the waitress was great, she showed us the different types of teas and when the food came she told us what each item was made of. The DEQ lounge didn’t look too grand for high tea either, it was kind of dark and given that there were a few empty tables, it was still quite noisy. I felt like I was sitting at a local cafe but paying $70 per person for very little food. It’s kind of Luxury hotel tea , but not a high tea . None of British at all. Good enough for tourists. Uncomfortably dark inside, well patio is bright enough. Anyway Service is good . I had planned to come here for my best friends bachelorette and we all had a great experience. Our server was very knowledgeable and took the time to explain everything to us. The tea selection was amazing and the food was unique and really well crafted. All in all, we enjoyed ourselves! The Afternoon Tea at the DEQ Terrace & Lounge at the Ritz-Carlton Hotel in Toronto was lovely. I would like to especially thank Ally, my Server and the Young Gentleman who was the Host at the front entrance. Ally did an excellent job explaining the different courses of the Afternoon Tea and was delightful, warm friendly and professional. The Young Gentleman who greeted me as the Host was also warm, professional and very pleasant. Thank you for a wonderful afternoon enjoying Afternoon Tea at the DEQ Terrace & Lounge! It was nice, a little overpriced because it was marketed as special royal wedding celebration but there was only a small television that we could see from our table with no sound and the music the restaurant was playing was not related. The server was very busy. She gave us the bill before we were done eating and gently reminded us to be gone from the table by three. She came back around two and asked us if we would like to pay with credit, debit or cash. At about twenty past two she grabbed our teapots and dumped them without asking if we were done, we weren't. They were about half full because we actually had not had them that long. The tea was good but it was not that warm and we waited a little bit for it so I felt like we didn't have time to finish before she took them away. The food was good but make sure you follow up and confirm you are vegetarian before you go. That was another issue we had. It was nice but just slightly disappointing for us. I don't think I would go back. lounge was very dim for afternoon tea, one should request to sit by the windows for a better experience. In addition, it seems the afternoon tea bookings are all for the same time , so multiple tables were seated at the same time but there were only 3 staff members available to explain and introduce the tea experience at one time, leaving many tables without prompt assistance. Please consider staggering the seatings or hiring more wait staff! the food and teas were wonderful and pricing was reasonable compared to the other high-end tea experiences in toronto ! I had the afternoon tea set. I guess at this price point, I was expecting the food to taste better. It wasn't bad, just nothing special. The bread for the sandwiches was a little dry. The desserts looked cute. We got there at 3pm and by 4:15 they were already asking us if we wanted to pack out leftovers and handed us the bill! I would have expected them to at least let us enjoy and relax for a little longer. Being a great fan of afternoon teas for many years, "high tea" or "English afternoon tea", I have tried them all cross Canada and London, GB. Since the price is normally over $50 USD per person in all the 5 star hotels, all I focus on is the food, service, tea sets, and environment. Generally, Toronto's afternoon teas are lacking the sprites of English afternoon tea. Taking the scones as an example, most places would bake it as big as they can. The Onmi King Edward hotel has the biggest so far, the size of a lady's fist. I was happy to see Ritz has it the right size. Sandwiches, wraps, and sweets are good. I would describe them as "fresh" than "exquisite". The tea collection of Ritz is well balanced, the tea sommeliers chose the good combination, rather than over powering the elements. Service is lacking! Ritz Carlton has always been my favorite hotel in the world, and I have experienced exception services in many other countries. A girl massed up our orders, instead of getting it right the first time, she blamed we took the tea container out and massed the orders. How about label the tea name on the container and make everybody's life a litter easier? During this two and half hours, we had one milk and sugar set for 4 people, only one of us takes milk for his tea and he had to ask twice to get some more milk. We also waited about 20 minutes to get a refill of the tea pot. And it was done by waving to the man who was filling water to the pots at the station. This is not Ritz standards!!! The lounge is bright with good lighting, good place to take photos. Lovely afternoon tea at the Ritz! It was our first time having afternoon tea, and our server was extremely thoughtful and attentive. Lots of variety in food dishes (and very delicious, especially the scones), and well-portioned - we had to take a to-go box, and our server even snuck in extra treats into the box. I’ve already recommended their afternoon tea to others! My family and I thoroughly enjoyed the High Tea this past Sunday afternoon. The ambiance was lovely and our hostess was very cheerful and informative. We very much enjoyed the tasty sandwiches, and the desserts were in abundance. Our favourite items by far were the fresh scones with Devonshire cream and the mini croissants. A little pricey, but still worth it!